The Book of Trees: Visualizing Branches of Knowledge has been out for six months and during this time it has received a great number of positive reviews from publications like Wired, New Scientist, Fast Company, Nature, Print Magazine, The Boston Globe, and many others. The book keeps making its rounds on Twitter and there might be a few translations coming out next year. I recently realized I never wrote a post on the underlying structure of the book, so in case you’re curious, here it is. As exposed earlier in the year, The Book of Trees covers over 800 years of human culture through the lens of the tree figure, from its entrenched roots in religious medieval exegesis to its contemporary, secular digital themes. 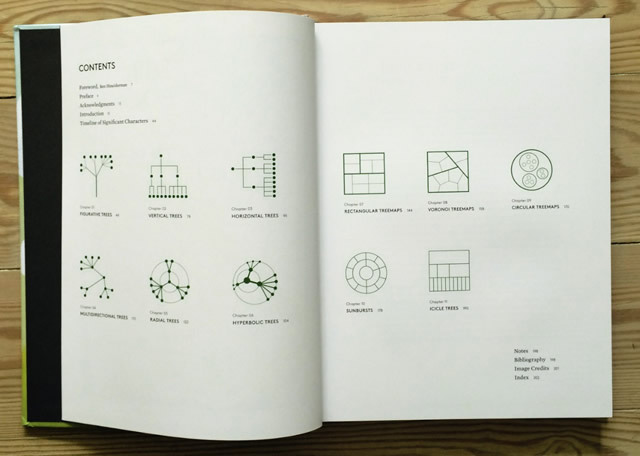 With roughly 200 images, the book offers a visual evolutionary history of this universal metaphor, showing us the incremental adoption of a stylized, abstract construct, as well as a recent emergence of new visual models, many employing advanced computer-generated algorithms. 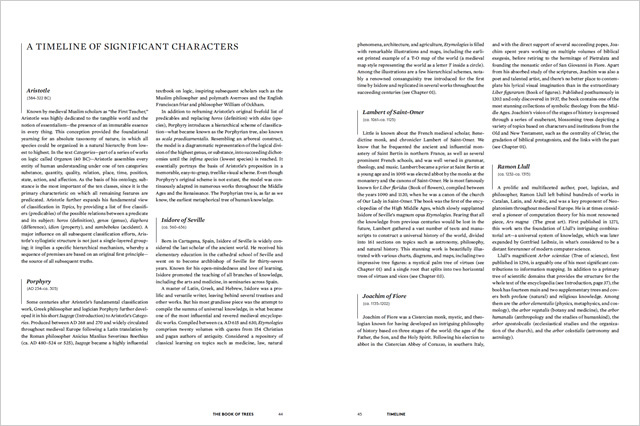 The eleven chapters that compose the book feature a number of visual methods and techniques for the representation of hierarchical structures. The first (and longest) chapter features primeval tree diagrams, which bear a close resemblance to real trees and are, at times, significantly embellished. The remaining ten chapters can be grouped into two sections. The first, comprising chapters two through six, covers the earliest forms of diagrammatic, abstract tree charts and includes different types of node-link diagrams, where given nodes, entities, or “leaves” are tied across different levels by links, edges, or “branches.” The second group, encompassing chapters seven through eleven, explores more modern and recently popular approaches, showcasing various types of space-filling techniques and adjacency diagrams that use polygonal areas and nesting to indicate different ranking levels. The book also features a Timeline of Significant Characters: key people in the establishment of the tree metaphor in depicting almost every relevant aspect of knowledge throughout the centuries. Amongst the twelve characters listed are the names of Aristotle, Joachim of Fiore, Ramon Llull, Francis Bacon, Charles Darwin, and Ernst Haeckel. You can continue following updates on The Book of Trees on its official website or its Facebook page. During a sumptuous dinner last February in Shibuya, Tokyo, following a long visualization workshop, my welcoming hosts presented me with a gift: an exceptional book by Japanese researcher Minaka Nobuhiros, entitled Phylogeny Mandala: Chain, Tree, and Network. I was immediately hooked. Published in the end of 2012, and including a few references to Visual Complexity: Mapping Patterns of Information, Philogeny Mandala is a well curated visual journey into the tree diagram and by far the closest book in scope to The Book of Trees: Visualizing Branches of Knowledge. This deduction is purely based on the association of images within the book, since unfortunately I’m not fluent in Japanese. Minaka has been an avid scholar of phylogenetic diagrams, biological classification, and evolutionary science, as you can attest from the sheer number of books and papers showcased in his website. When I first discovered his work, I was extremely joyful for having found such a kindred spirit. Today, I’m very excited to announce that Minaka will be translating The Book of Trees to Japanese, to be published by BNN in 2015. I simply couldn’t hope for a more knowledgeable and qualified translator.